Thai – A restaurant that is definitely something to write home about! Some restaurants seem to beckon to their guests to return like sirens beckoning from the rocks to sailors. 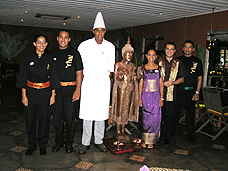 Thai at the Casa Grande Hotel Resort & Spa, www.casagrandehotel.com.br, is one such restaurant. Having eaten at the restaurant in January 2004, we were entranced to return in January 2005, and were delighted to find that the restaurant still excels at their service and cuisine. Edward F. Nesta, Dr. Daniela Bittencourt, Dr. Andre Malta and I had dinner one evening during our stay at the hotel, with Paulo Roberto Cupertino, Operations Manager, who is the man responsible for the creation of Thai, and found out how he upholds the restaurant’s high standards. His secret is simple: once every month, he tastes the entire menu to ensure that Thai maintains its high levels of consistency. Looking at the numerous selections on the menu, to state that Paulo Roberto is dedicated to his job, would definitely be an understatement, but what tasty work it is! Since our stay at the hotel in 2004, some things have changed. First of all, Thai, which was located on the beach in 2004, has now moved into the hotel, but has direct ocean views and the new décor at the restaurant is gorgeous. 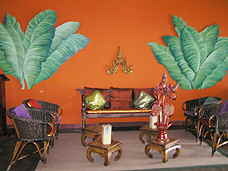 Inside, the walls are a deep rich ochre color, exotic sculpture, plants and color contribute to its warmth, and even the staff is dressed in Thai influenced clothing. Outside, there are dark wood tables along the patio, where the guests have front row views of Praia da Enseada, and there are Thai inspired banners along the walls. In addition to our old favorites on the menu, Paulo Roberto has been busy consulting with Chef Mixeu to add a few new exotic creations to the menu, which of course, we tried. We began our evening with exotic cocktails with names like Hong Hern (Vodka, white wine, pineapple juice and soda), Asia Cocktail (Guava juice, rum, sugar and ice), and Ob Chea (Orange, pineapple and lemon juice, lemon soda and grenadine), followed by an appetizer odyssey of Kung Sarong, (Fried Shrimp with spice paste, wrapped in wonton skins – which the chef shares the recipe for in Chefs' Recipes), Pu Cha, (Crab dumplings with Thai spices), and Pra Chan Kra Das (Harumaki fried pastries stuffed with shrimp, fish and Thai spices). The Kung Sarong was a delightful combination of textures – crispy wonton exteriors with succulent large shrimp inside with herbs, served with a plum-like sauce that was sweet and yet spicy with tiny pieces of chopped chilies. 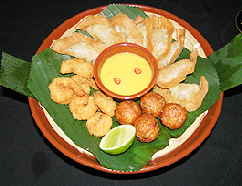 Although the sauce was delicious, I ventured and found a more adventurous sauce in a small dish of nam pla soy sauce and fresh red chili, which I sampled and found to have a pleasing “mouth hot.” All the appetizers were beautifully presented on banana leaves to showcase their exoticness. We thoroughly enjoyed sampling all of the delicious appetizers, and happily went from one sauce to the next, experimenting with different sauces for each of the appetizers creating new and interesting flavor combinations. To accompany the rest of our culinary exploration, Paulo Roberto selected a 2001 Regaleali Tasca D’almerita, a white wine with a very fragrant nose, which was soft on the palate with flavors of fresh fruit and plums, and was an excellent companion to the rest of our selections. Next on our culinary journey was Yam Thalae (Squid, shrimp, octopus and fish with fresh tomatoes, onions, celery and coriander leaves), which was a delicate yet extremely flavorful and fresh-tasting dish with crunchy celery and lemon juice. It was the perfect summer salad, light and flavorful. For our main courses, we selected the Pla Meuk Tod (Sautéed squid with celery and oyster sauce), the Kung Tod Grathien (Stir fried garlic prawns with bamboo shoots and chili pepper), which was a superb dish with sliced ginger and redolent with garlic and basil, accompanied by jasmine rice with a delicate hint of coconut milk to elicit an unexpected, but delicious slight sweetness. The Ikan Bali Colo Colo (an Indonesian recipe of Grilled fish fillet with fresh tomatoes, onions and Indonesian spices), was another excellent dish, and was Andre’s and Daniela’s favorite if they had to pick just one. As for me, the Kaeng Phet Kung (Thai red curried shrimp with mango) with its rich spiciness had the perfect combination of heat tempered with balance; Edward loved the Gaeng Ped Pet Yang (Duck in a red curry sauce with lychees and Thai lemon basil), in its spicy sauce with flavorful lychees. The desserts at Thai are as inventive as the rest of the menu, so we had to sample the Ice Cream Mamuang Sauce Takrai Longan (Mango ice cream with lemongrass sauce and longan fruit), Es Krim Asan Jambu Biji Cabe (an Indonesian dessert of Tamarind ice cream with guava and chili comfit), Es Krim Kelapa Kacang Tanah Jahe (also an Indonesian dessert of Coconut ice cream with toasted peanuts and ginger comfit), and Sa-Khoo Piaek Linchii (Thai tapioca pudding with lychee). Of course, with four different dessert selections, we each had to try a sample of each dessert. I can assure you that not a spoonful was left of any dessert. Thai restaurant is definitely something you will want to write home about, but then again, you may just want to keep this special restaurant all to yourself! Read our articles on Casa Grande Hotel Resort & Spa in Hotels & Resorts, Spas and in our 2003 article in the Destinations section – Best of Sao Paulo. © April 2005. Luxury Experience. www.luxuryexperience.com All rights reserved.